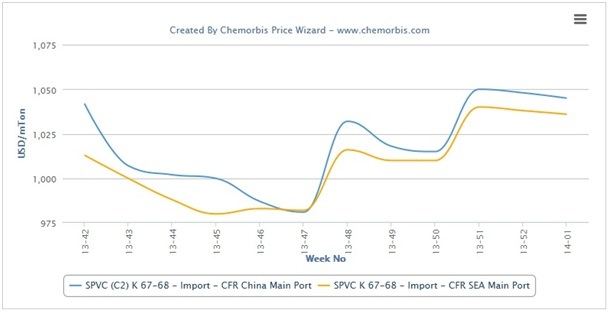 Sources from Asian PVC producers continue to adopt a firm stance on their pricing policies following the increases they obtained for January cargoes as per the pricing service of ChemOrbis. These sources have already expressed higher sell ideas for February in major Asian markets including China and Southeast Asia. These increase intentions were mainly attributed to the strong ethylene costs in addition to lower PVC operating rates given feedstock shortages in the region. Meanwhile, official announcements for February are not expected to be revealed before the middle of January. In China, soaring spot ethylene costs and lower production rates at some domestic producers kept the PVC market stable week over week. January done deals on imports were reported $30-40/ton above December for Asian origins. A Taiwanese major voiced their February PVC sell ideas with increases of $20/ton from their most recent January deals in China. 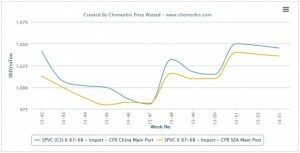 “We expect offers to remain stable to firm due to firm spot ethylene prices and upcoming turnarounds in the new year. We are optimistic about February when we may see consecutive gains,” a producer source noted. In Southeast Asia, PVC producers held firm on their January hike targets, pointing to high upstream costs as the main reason for their strong stance. Import prices were unchanged in both Southeast Asia and India on a weekly basis. “We are not willing to give discounts now as upstream costs are firm while we expect to see reduced competition from American suppliers now that the construction sector is beginning to pick up again in the US,” a producer source at a Taiwanese major stated.